David Terranova-directed documentary The Road To Vermillion, capturing what happened when Lazarus invited a host of musicians to collaborate with him at a woodland retreat just outside of Mexico City. This is how you make a mini doc. 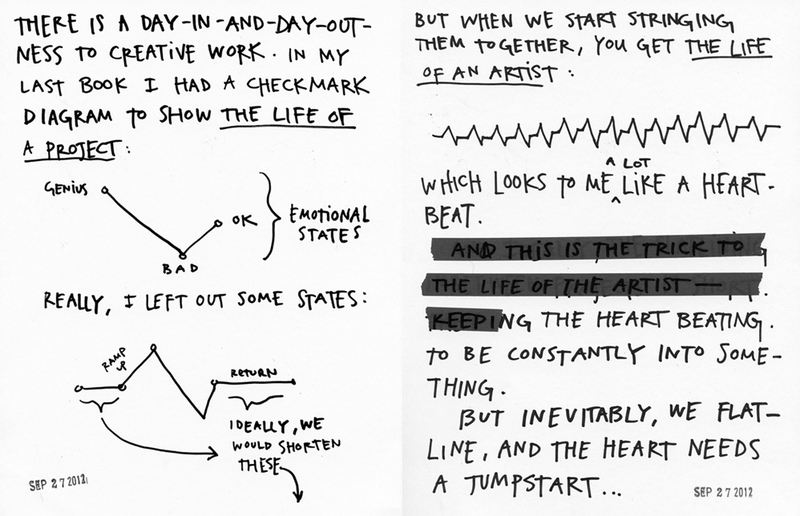 Gotta love Austin Kleon's take on creative rhythm. "The Purkinje effect (sometimes called the Purkinje shift or dark adaptation) is the tendency for the peak luminance sensitivity of the human eye to shift toward the blue end of the color spectrum at low illumination levels. The effect is named after the Czech anatomist Jan Evangelista Purkyně. This effect introduces a difference in color contrast under different levels of illumination. For instance, in bright sunlight, geranium flowers appear bright red against the dull green of their leaves, or adjacent blue flowers, but in the same scene viewed at dusk, the contrast is reversed, with the red petals appearing a dark red or black, and the leaves and blue petals appearing relatively bright." Edit: 'Technømate' video up now! We want you to take from us. We want you, at first, to steal from us, because you can’t steal. Still find myself coming back to David Terranova's starting approach to the Bloc 2012 festival campaign: show the building full of flashing lights and smoke, but empty. Subversive, experimental, strong, and beautiful. The act of filling a sketchbook is the act of becoming comfortable transferring your thoughts from your mind onto a page.